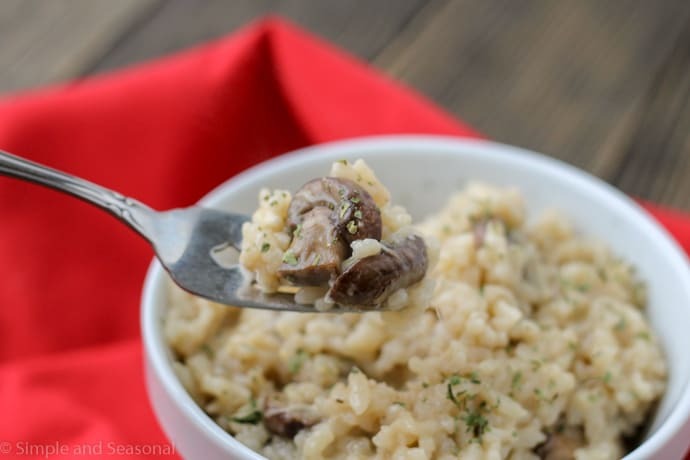 Rich and incredibly flavorful, Crockpot Express Mushroom Risotto is so much easier to make than its stove top counterpart! 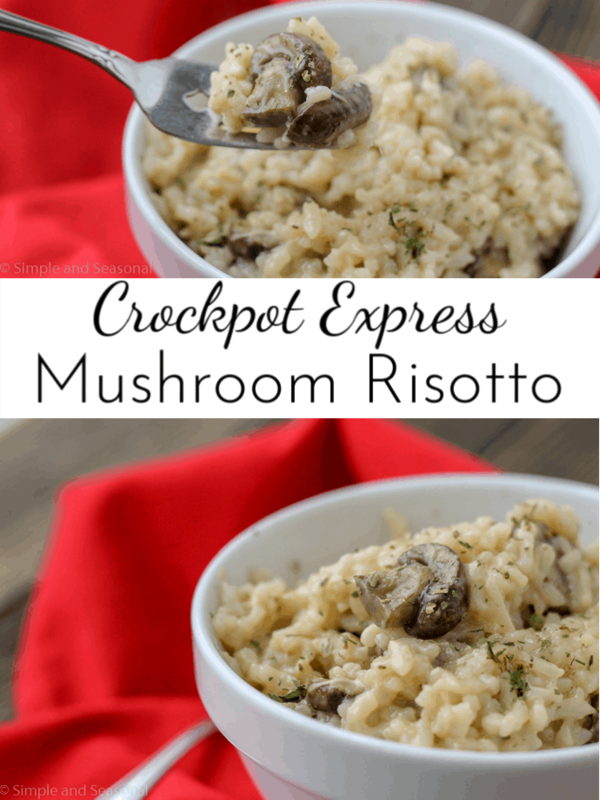 Since I’ve already done a lot of rice cooking in my Crockpot Express, I decided I would tackle risotto. 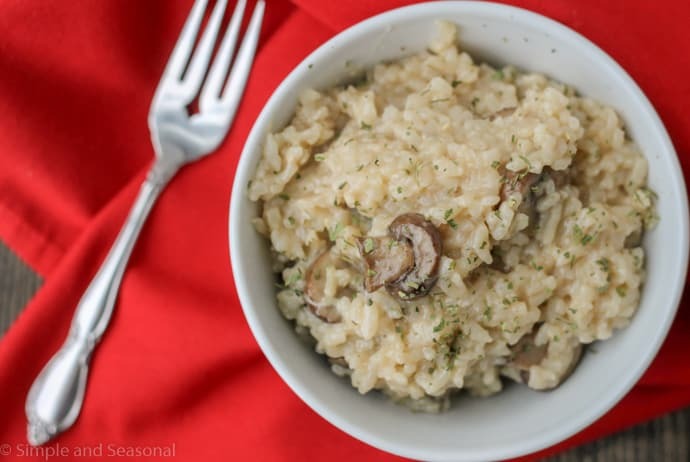 I LOVE a good risotto-if we go out to a nice restaurant, that’s what I’m ordering! 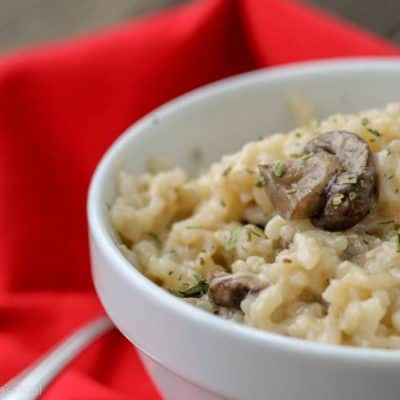 This Crockpot Express Mushroom Risotto recipe makes a BIG pot of deliciousness, so feel free to cut it down if you like. For best results, though, stick with good quality ingredients! Be choosy when it comes to your Parmesan cheese and mushrooms-that’s where most of the flavor is coming from in this dish. Remove the lid and set aside. Press Brown/Saute and add oil to the bottom of the pot (I drizzle with EVOO) Allow to heat up for just a couple minutes. Add onions and garlic. Saute for 1 minute. Add mushrooms. Stir regularly and continue to cook on Brown/Saute until soft-about 5 minutes. Press Start/Stop. Add rice and broth to the pot. Stir well. Cover and lock lid. Turn steam release valve to closed. Press Rice/Risotto and leave the time set for 12 minutes. Press Start/Stop. When cooking cycle ends, allow natural pressure release for 5 minutes. Then flip the valve open to release any remaining pressure. Open lid and stir in Parmesan cheese. Garnish with parsley and serve hot! Make this a meal by adding cooked chicken! 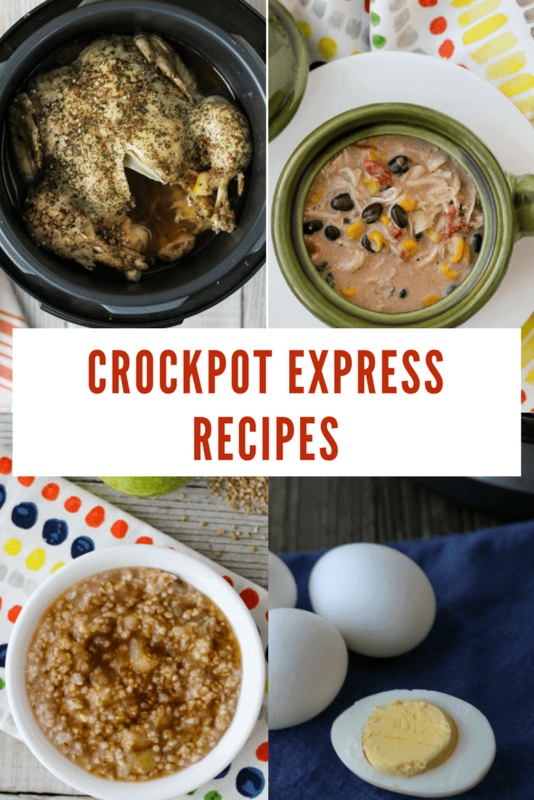 For more great Crockpot Express Recipes, check out this ever-growing list! Really good and easy too! Great for a side dish or main course. I might add some chicken next time to serve it as a full meal!